Jamaica has been listed in the Top 25 Best Destinations in the World for 2019 on renowned travel website TripAdvisor. The island is the only country in the Caribbean to do so, and ranks among destinations such as London, Rome and Paris. Awards’ “World’s Best Destinations” list and is also listed as the best destination in the Caribbean. Awards’ for Beaches. TripAdvisor recognized 352 beaches around the world. Award winners for the Best Destinations awards were determined using an algorithm that took into account the quantity and quality of reviews and ratings for hotels, restaurants and attractions in destinations worldwide, gathered over a 12-month period, as well as traveler booking interest on TripAdvisor. While winners for the Beaches awards were determined based on the quantity and quality of traveler reviews and ratings for beaches on TripAdvisor, gathered over a 12-month period. TripAdvisor is the world’s largest travel site, with over 730 million reviews and opinions covering the world’s largest selection of travel listings worldwide. It covers approximately 8.1 million accommodations, airlines, experiences, and restaurants. For all of the 2019 Travelers’ Choice Top 25 Destinations, go to tripadvisor.com/TravelersChoice-Destinations. Ranking fifth out of 25 for the Best Beach in the Caribbean and tenth out of 25 in the World, TripAdvisor recognized 352 beaches around the world. Winners were determined based on the quantity and quality of traveller reviews and ratings for beaches on TripAdvisor, gathered over a 12-month period. 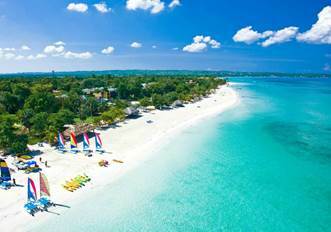 “Congratulations to Negril’s Seven Mile Beach for being named a Travellers’ Choice Beaches winner this year. Our Traveller’s Choice awards are even more special than other editorially selected awards because these winners are determined through review data by our global community. From beautiful crystalline waters and golden sand, to stunning rugged coastlines where you can spot exotic wildlife, this list has something for everyone,” said Desirée Fish, vice president of global communications for TripAdvisor. To see TripAdvisor traveller reviews and opinions of Negril’s Seven Mile Beach go to https://www.tripadvisor.com/TravelersChoice-Beaches-cTop-g147237. For the complete list of Travelers’ Choice award-winning beaches for 2019, visit: https://www.tripadvisor.com/TravelersChoice-Beaches.